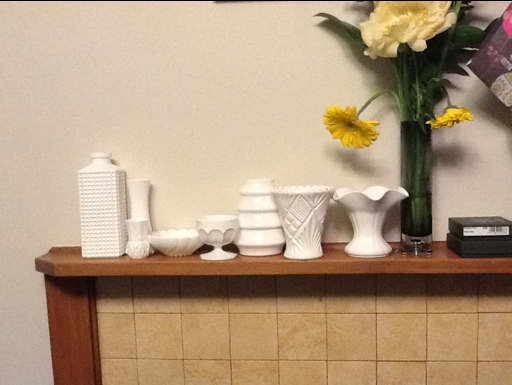 Our house is a 1940's deco-ish house, although there aren't many deco features which is sad. One of the features is a fairly grungy tiled fire place with a simple wood surround. A medium term project for me is to make the fireplace over, and I decided to start with some nice decoration for the mantel. I'd seen a couple of cool images on pinterest formula glass, which was the sort of look I was after. But a couple of things thwarted that plan, in that I don't have much of a budget for my make over and milk glass can be pricey, and it's really difficult to find milk glass in NZ as its really an American product. 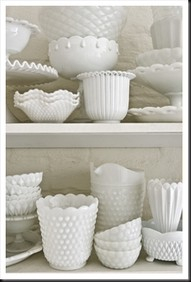 But then after more Pinterest cruising I found this tutorial for making faux milk glass! Genius! So a trip to the store at the landfill where I found 8 pieces of glassware for $5, a can of glossy white spray paint, a quick stop at the local sallies store where I found a couple of extra pieces for a dollar each, some latex gloves, and I was away laughing. I still have a few pieces left to do, but here's the result so far, I love it!